What is it? The perfect, two-in-one tool for defined brows. An angled brush head with firm bristles lets you fill in and define brows with NEW Long-Wear Brow Gel (sold separately), while the spoolie brush end grooms brow hairs into place. Who is it for? Anyone looking to create a polished, defined brow look with one simple tool. Why is it different? Designed with a blend of natural and synthetic bristles, the Brow Definer has a sharply defined edge and stiff bristles, giving you maximum precision while shaping and filling in brows. Bristles comb through brow hairs to coat them evenly with pigment for incredibly natural-looking definition. Once brows are filled in, the compact Brow Groomer smoothes brow hairs into place and blends color. 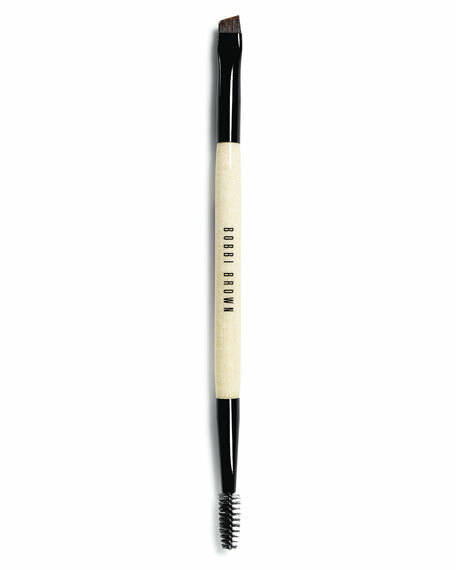 How to use it: Use the Definer end of the Dual-Ended Brow Definer/Groomer Brush to pick up product. Start at the inner corner of the brow and use short, even strokes to fill in the entire length of the brow's natural arch. As the brow tapers, use the narrow edge of the brush for more precise application. Then, use the Groomer end to shape brows and soften color, brushing brow hairs up and over. Angled brush sweeps on powder eyeshadow for allover base application plus definition on the outer lid and crease. All Estee Lauder brushes are composed of the finest quality materials and are designed to ensure the highest level of makeup artistry.